China is notorious for having trouble with air pollution, but now they are trying to come out with an innovative solution. Italian architect Stefano Boeri’s colossal ‘forest city’ scheme – a newly built metropolis that will ‘eat’ its own toxic smog with one million plants and 40,000 trees. The idea is to challenge preconceptions that urban density intensifies air pollution, by creating a new blueprint for city design that integrates plants into its construction. 100 different species of plants are planned to grow on balconies and roofs of the city’s skyscrapers, lining 175 hectares along the Liujiang River in Southern China. Once completed, the shrubs will breathe in fine dust from the air, catching and soaking up pollutants from the toxic environment. When the city is fully grown, it will be able to absorb almost 10,000 tons of CO2, 57 tons of pollutants per year and produce approximately 900 tons of oxygen annually. 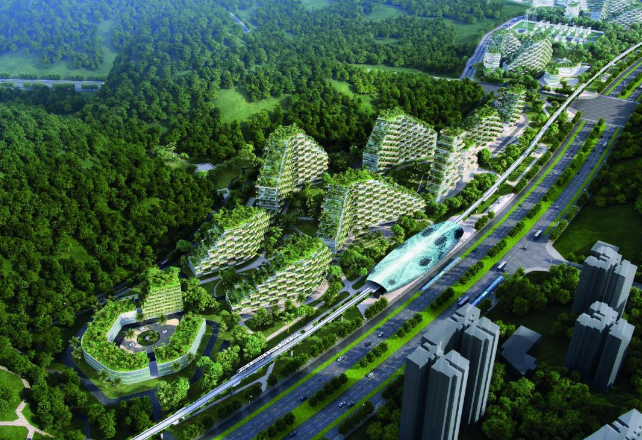 The new green city in Liuzhou will reportedly host 30,000 people, with hospitals, schools and fast electic rail services all part of the construction.The project was commissioned by the Liuzhou Municipality Urban Planning and will be constructed in the north of Liuzhou along the Liujiang river. The construction of the green-city-in-the-making is currently underway and will be finished by 2020. Occupying 432 acres, the Liuzhou Forest City will be roughly half of the size of the Central Park in New York. There are also plans to fit geothermal and solar energy resources, so the city runs on a green and self-sustainable power source. If successful, the forest city could be a blueprint for other countries where air pollution is an issue. Food is not a business like others. Food is not a commodity; it is not a consumer good – It is far more important. It is a human right, so defined by the United Nations. We know the global industrial food system did miracles to broaden food access and reduce hunger. But it is reaching its limits. We are the first generation that consciously lives with them: obesity and malnutrition. Waste of food and water. Soil depletion. Climate change. Forced labor. Lack of women’s empowerment. The solitude of farmers. The crowds of migrants. They are all interconnected issues and related to the fact that the food system has disconnected people from their food. Many kids and even adults don’t even know the link between meat and animals, between fruits and trees. And this is a problem. Emmanuel Faber believes that the founding vision set for his company by Antoine Riboud, inspired by discussions with the young generation of the May ‘68 French revolts, is the right one for our company: a dual project of both economic value creation and social progress. Antoine had a lifetime commitment to this vision, followed by his son Franck, who, in two decades as CEO of Danone, revived the Carasso family’s vision of yogurt as a health product and led us to create a unique portfolio of health-focused food and water brands. Starting with taking care of the people: Since a decade, Faber has designed a unique global health insurance program, benefiting 70,000 employees in 25 developing countries. He aims for Dan’Cares to cover our 100,000+ people, and possibly more. He also launched a unique, gender-neutral Parental Policy earlier this year. We are wholeheartedly convinced of how critical the first 1,000 days of life are. We have therefore pledged to fully empower all women in their choice of nutrition and to support breastfeeding. That has changed the way Faber and company operates Aptamil, Nutrilon and all of his local brands. They have pledged to make their breastmilk substitutes available to low-income families in a not-for-profit model. We know such models can exist because a decade ago, we invented social innovation platforms to make “One planet. One health” a reality, starting with the Grameen Bank in Bangladesh and Danone Communities’ “social business” to bring access to water and nutrition. Our Danone Ecosystem Fund builds skills, social and economic opportunities for people in our food and water ecosystems, from farmers to street vendors and landfill scavengers in 70 countries. Livelihoods, a CO2 credits-powered investment platform, supports farmers to plant trees, helping them to create a sustainable living and connecting them on global supply chains. We already work with partners on these platforms, but they could be grown much further at scale. Because in many countries consumers are shifting away from conventional food and retail and are exploring alternatives. This is putting pressure on the short-term performance reported by the large food and retail companies. Short-termism is a risk higher than ever, whilst what is at stake is the balance of efficiency and sustainability across time horizons. Should we surrender on the transformation to address the revolution and just focus on extracting capital out of our businesses, making a few even richer and a darker future for many? Last week in Berlin, the Consumer Goods Forum Summit gathered around “global learnings from local successes.” Rightly so, as local food brands keep gaining share against global brands every year. People believe local is a way to reclaim their right to food: This is the lesson to be learned. In France, Faber’s government is bringing together, next month, a critical nationwide, multiparty conference on Alimentation, a word Danone uses to describe food sovereignty, and which encompasses cultural relevance, transparency and fairness. So, now is the time when those who dare to believe that food sovereignty should be the goal of this industry — like Danone and many others — should start to more broadly support and be catalysts of change for people to reconnect with their food. Because food is a human right. Faber and his companies are trying to have an entire generation change and be known as the Food Generation.